Gov. Lamont announced on Wednesday that he's leaning toward tolling of all vehicles in Connecticut, rather than concentrating on trucks. Seven transportation-related bills were discussed at a public hearing at the Legislative Office Building in Hartford Wednesday. Lawmakers from the state legislature’s Transportation Committee listened to the testimony – one of the bills would authorize the Department of Transportation commissioner to submit a toll proposal to the General Assembly. Before the hearing started, Lamont addressed the two tolling options proposed in his biennial budget. He said he recognized that tolling all vehicles would force Connecticut residents to pay up. 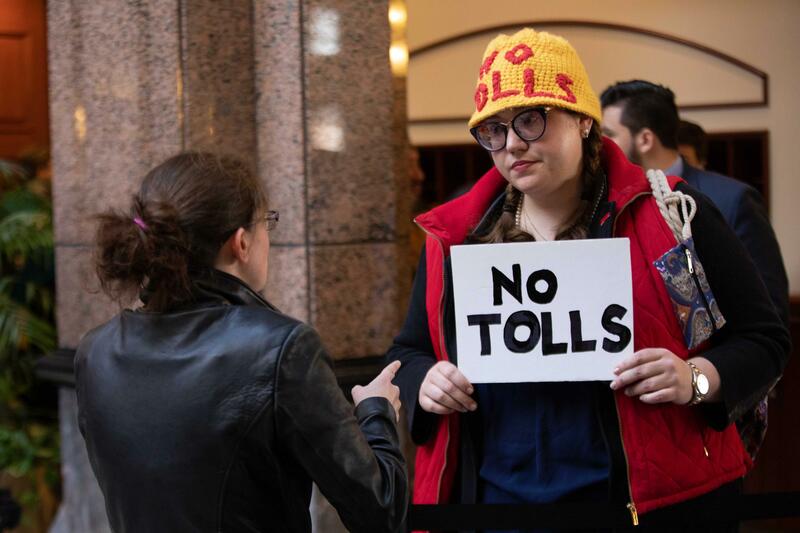 Hundreds of people came to the Legislative Office Building in Hartford on Wednesday to show their support for or opposition to tolling in Connecticut. Members of the general public were also able to use the hearing as a platform to weigh in on tolling. Hilary Gunn, a worker at a nonprofit that serves the elderly, said it’s not necessarily about the money. “It’s not so much about not wanting to pay a toll but I feel that we already pay for our roads and we’re rewarding failure by continuing to give money to a failing government,” said Gunn, who’s from Greenwich. John Daddona, an apprenticeship coordinator for a local chapter of the International Union of Operating Engineers, supports tolls. He said that if tolls are put up, that would make drivers pay for the roads they use every day. It would also mean more work on infrastructure projects for him and his colleagues. “We have the talent here to go to work to move the state forward for many years,” he said. The administration said expanded tolling could generate $800 million in revenue. Lamont believes that’s the best way the state can make an investment in transportation infrastructure. Senate Republican leader Len Fasano disagreed. He and his colleagues are pushing an alternative related to money already being bonded by the state. Under the Lamont proposal, tolls would be not be implemented until at least 2024. The plan calls for 53 tolling locations across Connecticut.